The Company, under the name “Estaleiros Navais De Goa”, was established at Vasco da Gama in November 1957 by a special decree issued under Portuguese laws. Following the liberation of Goa in December 1961, this Company was taken over by the Government of India and was given on lease to Mazagaon Dock Limited from April 14, 1962 to Sept. 30 1967. The name of the Company was changed to Goa Shipyard Limited with effect from Sept. 29, 1967. The Company started functioning under its own Board of Directors with effect from October 01, 1967. GSL is a Central Public Sector Undertaking under the administrative control of the Ministry of Defence, Department of Defence Production and Supplies. GSL is strategically located on the banks of river Zuari in Goa, a major international tourist destination well connected by its international airport and major port enroute all important shipping lines. Beginning as a small barge building yard, GSL has garnered reputation as one of the most sophisticated ship builders in the Country. For over four decades, GSL has designed, built and commissioned a wide range of sophisticated vessels for varied applications in the defence and commercial sectors with special expertise in building modern patrol vessels of Steel and Aluminium hull structure. The pedigree of GSL dates back to the early 60’s when it offered high quality workmanship in ship repair and modernisation. Today, ship repair and refits range from routine maintenance, repair and surveys to major steel renewal, engine replacement, total machinery overhaul and extensive damage repair. The repair division’s dedicated team consisting of naval architects and engineers, having vast experience and extensive exposure in carrying out repairs of any nature, by using the latest tools and techniques have consolidated our standing as repair yard which timely executes each project . The repair team’s continuous quest for excellence has resulted in state of art docking and repair facilities. In-house welders, pipe fitters, structural fitters, electricians and carpenters are employed to ensure high quality, cost efficiency and rapid turn-around. By developing an excellent rapport with a worldwide network of suppliers, GSL has devised a rapid response program for expeditious supply of spare parts and prompt service, thus cutting down costly down time. GSL is reckoned as one of the best service provider in the nation with expertise in ship repairs. 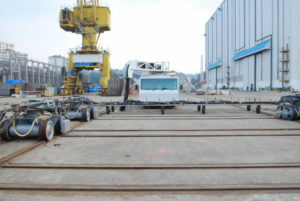 GSL has Shiplift & Transfer system. Lifting Capacity : 6000 Tons. 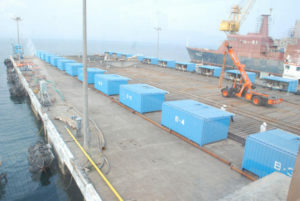 250mts long fendered Jetty equipped for berthing of the vessels on either sides. This jetty has the capability of double berthing of the vessels, with draught of 5.5 mts. The Jetty equipped with 2 nos 45T Level Luffing Cranes capable of lifting materials to height of 35 mts and outreach of 35 mts.13600.00 Sq.mts of Ship Transfer area is created for facilitating the transfer of vessels after docking through Shiplift and Transfer system on to the berths. This can accommodate four vessels of 120 mts or a combination of smaller vessels at a time. Some of our prestigious clients include Indian Navy, Indian coast Guard, Fisheries survey of India, Mazagaon Docks Ltd., Samson Maritime, Global Offshore, Great Offshore and more. 250m long concrete hard stand, providing the best access for inspection and working on Under water hulls, and, providing space for repair facilities to multiple vessels at a time. Adequate cranage facilities. An excellent workforce with vast experience on varied vessels. A dedicated facility for repair of commercial and defence vessels. Prompt delivery and Customer satisfaction.